Interactive installation “Blowing the clouds“, collaborate work between Lisa Horvath, Monika Rajkovaća and Valerie Wolf Gang, was awarded and presented at APU AWARDS. It all started with a childhood dream. Watching clouds and wishing to play with them as you blow them around the sky. Their playful textures and shapes, till now, invite us to look at the sky and imagine different stories. For our installation we’ve decided to merge these childhood dreams with different technologies, such as sound, data and interactive sensors. 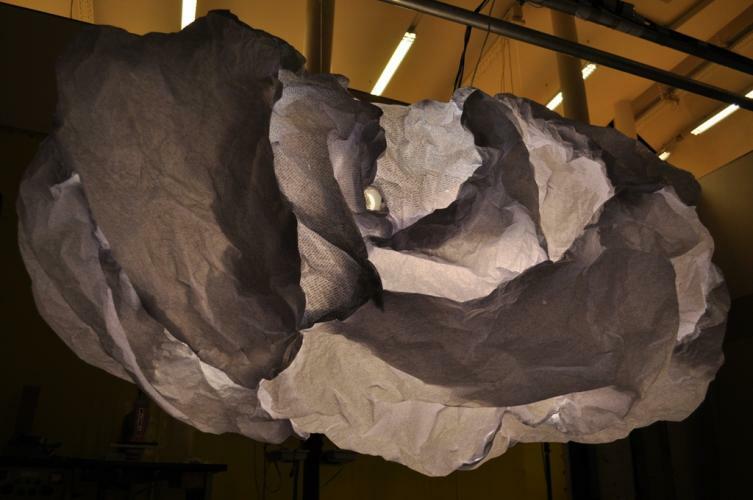 A huge cloud of crumbled paper seems to be floating in space, secretly suspended from the ceiling. It glows from the inside, so you can see the different structures and textures of the mashed paper. If you look closer you see small numbers printed on the paper. They present the same weather-data which is also used to generate the sound. On some places inside the cloud, we mounted sensors that measure temperature and humidity. When people blow there, it changes the direction and the speed of the sound moving in space. As the sound travels through the gallery you feel the cloud being blown away, represented by the soundscape surrounding you. The places where the sensors are hidden inside the cloud are indicated by small “cloud tornadoes”. Searching and finding them creates a playful mood, discovering the cloudssensitive points. On top of the cloud there is a sensor that measures it‘s movement. The small almost unseen movements of the cloud, produced by the people blowing to it and moving the air in the space, are also a trigger for small changes of the intensity of the soundscape. With our installation we want to raise childhood curiosity and playfulness amongst the viewers. The cloud becomes a big machine which manipulates the sound, so the visitors of the gallery become the co-authors of unique sound composition. Similar patterns we can also find in nature: the weather works like a huge complex machine. As we manipulate it, sometimes more or less consciously, we play with it, resulting in significant affects to the worlds climate. We are responsible for it’s final “composition”.